Camphor is a natural antiseptic. It helps to fight skin disorders, such as Eczema and Urticaria, and eradicates blocked pores that cause acne and blackheads. 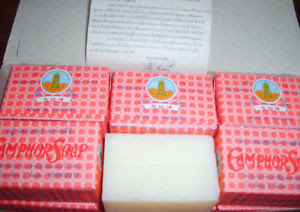 This is a very pure soap, containing no chemical additives or harmful perfumes or toxins. The other main ingredient, Borneol, is not an herb per se, it is nevertheless a common ingredient in many traditional Thai & Chinese herbal formulas. Borneol is actually a compound derived from dryobalanops aromitaca, a tree that belongs to the teak family. Borneol has a wide range of uses. It aids the digestive system by stimulating the production of gastric juices; tones the heart and improves circulation; treats bronchitis, coughs and colds; can relieve pain caused by rheumatic diseases and sprains; reduces swelling; relieves stress; and can be used as a tonic to promote relaxation and reduce exhaustion.In some parts of the world, it is even used as an insect repellant. Camphor and Borneol work well together to cleanse and soothe, leaving your skin feeling revitalised and fresh.